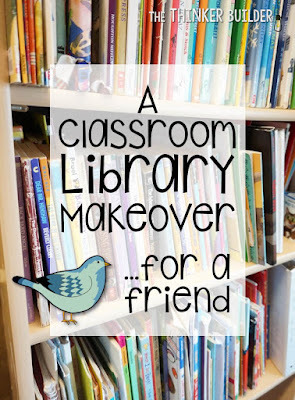 I did a makeover on Mrs. Hiatt's first grade classroom library. Now wouldn't it be cool if I said I'd scoured the country looking for a willing teacher to allow me into their classroom to re-do their library and happened to find Mrs. Hiatt? Well, the real story is a bit more personal. And cooler. Mrs. Hiatt is a first grade teacher. My oldest daughter, Maille ("My-lee"), actually was in Mrs. Hiatt's class just last year, so I know how wonderful a teacher she is. And she and my wife, Megan, are good friends. Oh, and did I mention that Megan teaches in the room next door to Mrs. Hiatt? So Maille got to spend first grade with a first-rate teacher with Mommy right next door. It was a special year, to say the least. 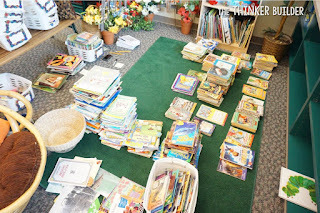 The week before school started this year, I was helping Megan re-organize her library. The whole fam came along: there was Megan, re-labeling a stack of books; me, sifting through chapter books, deciding which series should be a category; Maille, who was given the job of sorting a pile of picture books into realistic fiction and fantasy (though very slowly because of getting caught up in reading every other book in its entirety); Adelyn (4), who was dragging a cart around the classroom, making pit stops to nab Arthur and Froggy books from our freshly made stacks; and Emerson (2), who was following Adelyn around the room, moving said Arthur and Froggy books to locations never to be found again. Mrs. Hiatt popped her head in, and after chatting a bit, she asked if I'd be interested in overhauling her library. And that's the story behind the job. Now let's get to her library. 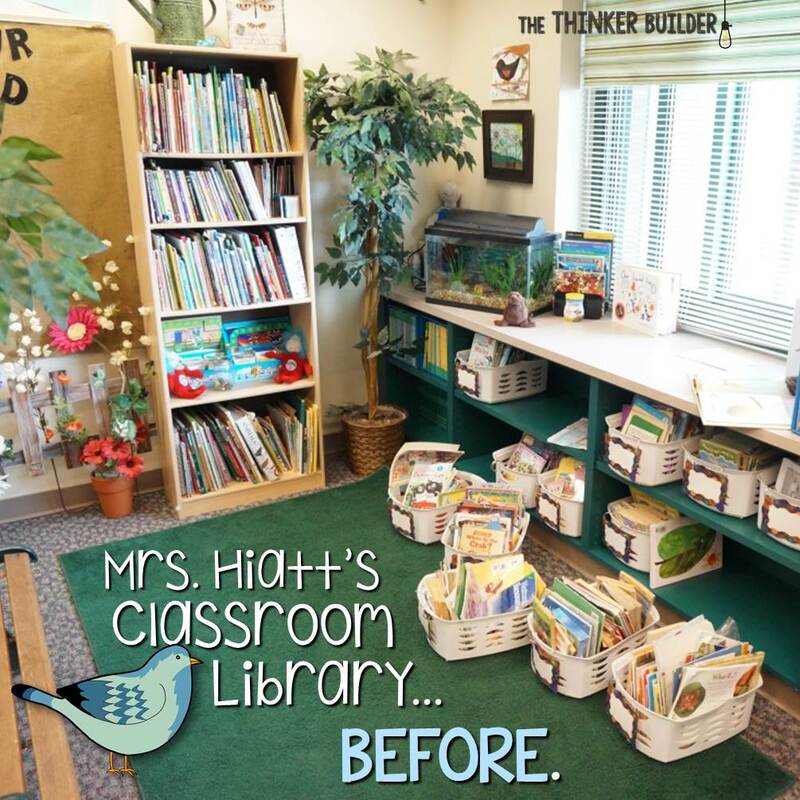 The next day I met Mrs. Hiatt in her room and we talked about her library. Mrs. Hiatt has a lot of books. 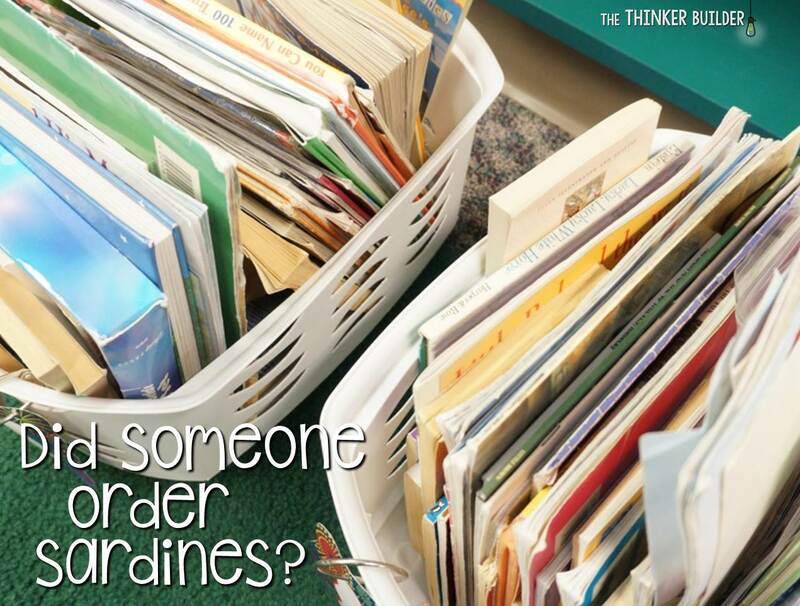 They were not organized: no categories, no labels. 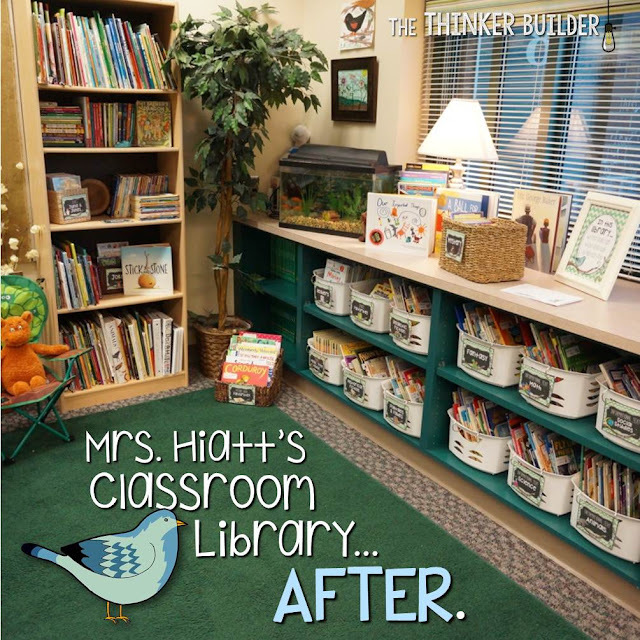 Mrs. Hiatt saw the advantages an organized classroom library would bring to her students. Mrs. Hiatt, in her classic go-with-the-flow style, gave me complete control. My main goal was to organize the current books within the current theme, using the majority of the current containers. Thus, the finished library would not have a drastic change in appearance. But infusing a new organizational system that would be easy for students to understand and maintain, coupled with additional details and touches of charm, would make the project a success. You can see that pulling out the baskets of books for a closer look revealed some issues. So that's where I started. Mrs. Hiatt left me to it. I dug in by unloading the baskets of books. I sorted as I went, mainly by genre, but on the look out for multiple books by the same author or within the same series. Being a first grade library, the chapter book collection obviously was not as robust, but on the other hand, I was finding a ton of nonfiction beginning readers. It was important that the library maintain an appropriate range of levels, so these books would be important to keep. 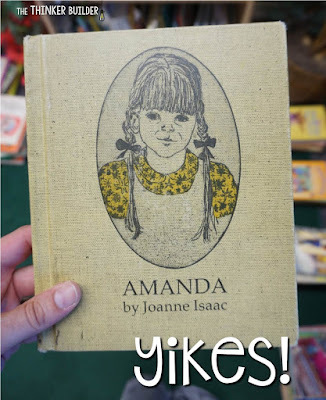 As it turns out, some of these very old books were Mrs. Hiatt's husband's childhood books. Not joking! (Luckily, the one pictured above was not Mr. Hiatt's.) 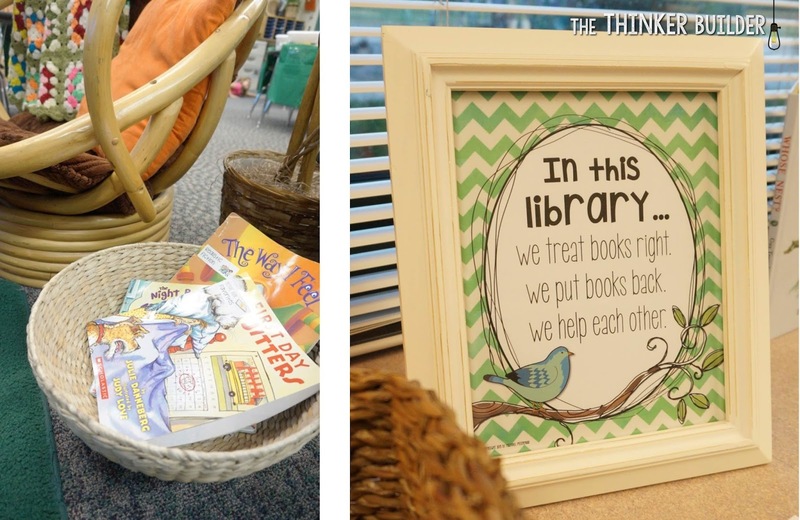 I love the sentimental value of these books and the personal connection that could be shared with students. But after my tongue-in-cheek suggestion for a "Vintage" category was turned down, most of these books were taken out, leaving more room for the more appealing books. After a couple of hours, the stacks had grown to teetering. It was then time to make some decisions about the categories. With the size of Mrs. Hiatt's main book containers rather large, I knew each category needed a healthy amount of books to fill the basket appropriately. The last major step was to create and add the labels, ones for the containers and ones for the books. 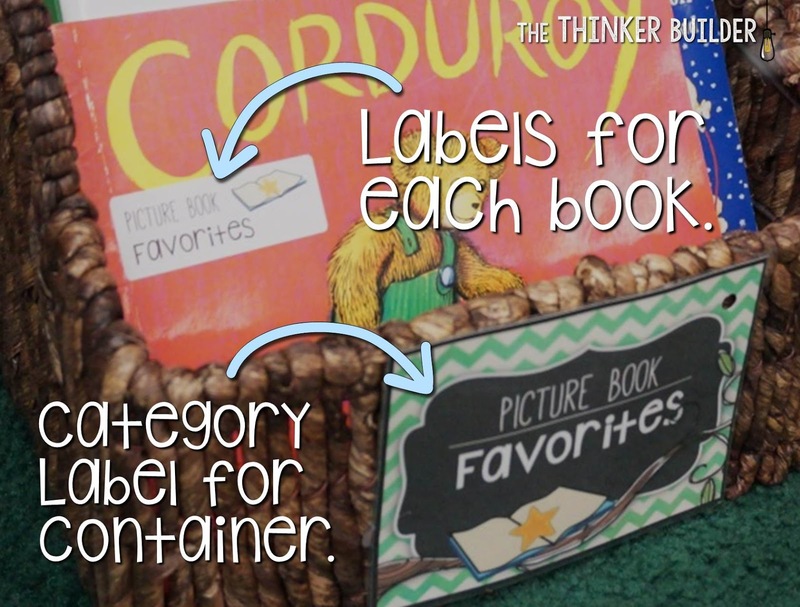 Since this is first grade, I added an image to each label to make it easier for students to match a book back to its home. I printed the book labels on 1" x 2 5/8" shipping labels, and made the category labels on card stock, four to a sheet. Putting Mrs. Hiatt's library back together was fun! Are you ready to see it? The large bookcase that was crammed with books received some needed attention. I reserved the top shelf for books that Mrs. Hiatt commonly uses in her teaching, and the bottom shelf for over-sized books. 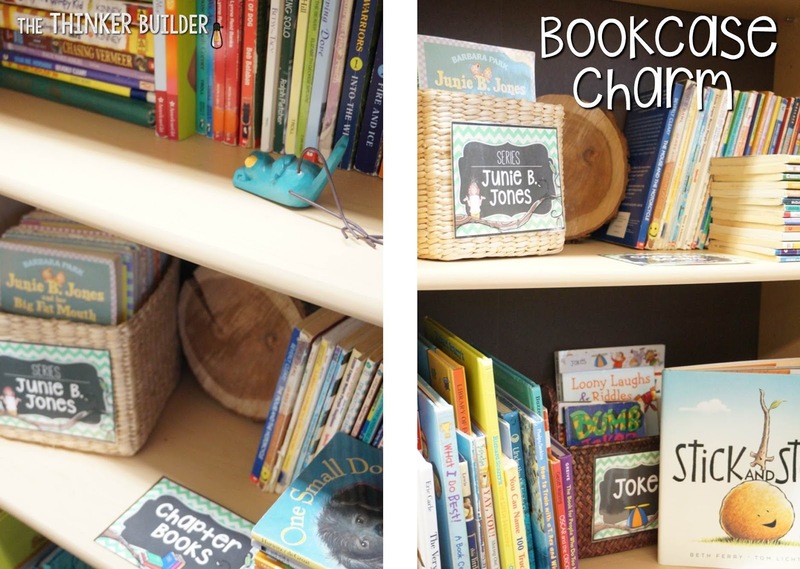 With the middle shelves, I de-cluttered a bit to make them more user-friendly, and added a little charm by turning some books horizontally, adding a couple of new, inexpensive baskets for a couple of her smaller categories, and placing some fun little knick-knacks that fit Mrs. Hiatt's nature theme. The built-in bookshelves hold the main stock of books, using the plastic containers Mrs. Hiatt already had, with category labels laminated and held on with metal rings. I placed a new wicker basket on the floor that fits picture books perfectly (50% off at Hobby Lobby made it less than $10). Next to a comfy chair, I placed a basket with some timely books, kind of like having the current magazine issues on your coffee table. Finally, I created a poster with simple library rules. I kept it in line with the nature theme and displayed in in a nice frame. I went ahead and made a few versions of the classroom library poster for YOU! And as a bonus, there are coordinating bookmarks included! Click the image below to take you to the free download from my TeachersPayTeachers store. Click the image above to get the free posters. 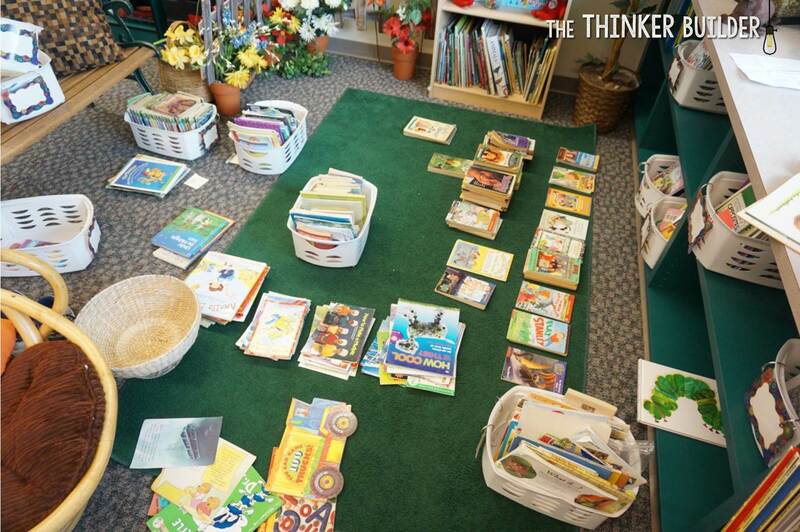 I hope you picked up a few insights into organizing a classroom library. 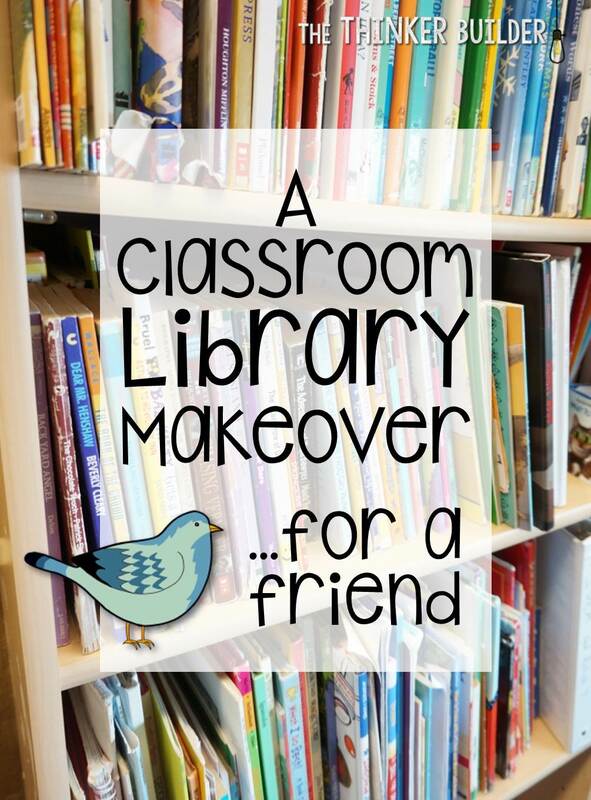 If you'd like more information about classroom libraries, check out my 5-part series HERE. Thanks!